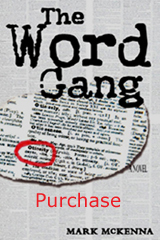 The Word Gang is the story of lives transformed by friendship and good vocabulary. The friendship is between an old philosopher (Mr. Spinoza) and a young girl (Kalisha Jackson). Mr. Spinoza can speak seventeen languages but has no one to talk to; Kalisha has cut school for a year without her parents or school finding out. Complicating matters is Kalisha’s new friendship with two boys: BD and Sahmbaht. She’s falling in love with both of them. And the good vocabulary? Let’s just say big words can be used in many ways — and not always for the best of reasons.